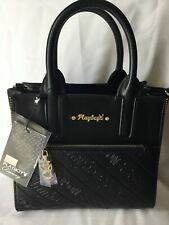 Kipling Ellettronico Digital Pouch with Wristlet BNWT. Kipling’s Ellettronico digital pouch is the perfect stylish accessory for the modern girl about town. Choose from a rich array of bold, warming colours and prints, all filled with chic feminine appeal. 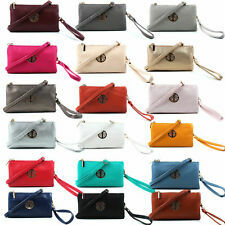 Smartphone Wristlet Wallet. Logo Embossed Faux Leather. Premium quality, “Saffiano” faux leather construction. Color: PINK. “G” Logo embossed panel at front. Smartphone/Cell Phone pocket at back with snap button closure. This very cute Victoria's Secret Wristlet is essential for any occasion. Perfect for keeping all of your night out essentials organised and on-hand. Removable wrist strap. Slip inside pocket for a credit card along with your phone and a lip gloss. LACQUER INDIGO WRISTLET. Wide detatchable wristlet in cotton webbing. CREATIVITY XL PURSE. ~ with Creativity the possibilities are endless ~. Stylish wet-look purse. Lightweight wipe-clean nylon fabric. Kipling Alia is a large card wallet with a sleek, sophisticated design. There is plenty of space inside to hold all your travel, ID, credit cards, cash and more! Round Kipling logo. Here's what you need to do. With the perfect place for all your essentials including your phone, this smooth faux-leather wallet is your go-to for every night out. 7"W x 4"H x 1"D. Our products are 100% authentic. Market leading designs and an exceptional reputation keep Kipling at the forefront of fashion. If you are a fan as we are, we hope to here from you soon. Helpful Links. Item will be despatched as soon as cleared monies have been received. Kipling Alia is a large card wallet with a sleek, sophisticated design. There is plenty of space inside to hold all your travel, ID, credit cards, cash and more! Round Kipling logo. 12 card slots. Size18.5 cm x 10 cm x 3.5 cm. KIPLING CREATIVITY XL (Extra Large) PURSE/MAKEUP BAG - SOFT FEATHER. Kipling monkey key ring. Ideal to keep your change, keys and even make-up, you’ll never be a scatterbrain again with this surprisingly roomy pouch. The size is 9" x 6". It has a detachable wrist strap. Build-in wristlet strap. A large clutch bag that big enough to hold everything you want. If there's a problem, just let us know and we will fix it. Soft PU Leather. Build-in wristlet strap. A large clutch bag that big enough to hold everything you want. Made of High-quality PU leather. Wristlet Clutch Pouch Bag. Travel Logo Faux Leather. Top zipper closure with faux leather heart charm pull. Pouch design. Carry all your essentials and travel in style…. Blush Pink. Color:BLUSH PINK. This very cute Victoria's Secret Wristlet is essential for any occasion. Fashion appliqués make this party-ready wristlet the right kind of extra. Perfect for keeping all of your night out essentials organised and on-hand. 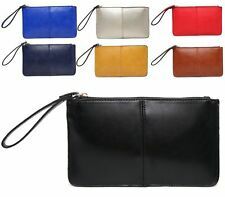 This is a delightful faux leather ladies wristlet/ clutch bag/ purse made by Clarks-size: 6.5in wide, 4in deep. It features feminine pink/ pastel colour floral pattern on white background, silver hardware, wrist strap and front zip closure. This wristlet has never been used. Should you have further queries, please do not hesitate to contact me. Thank you. Please take a look at my other items. Warmly, Trishia. This lovely LINEA beige faux leather pouch is BNWT. There is a small outer pocket to the bag which has a popper fastening. Logo Wristlet Clutch Pouch Wallet with Bow Charm. Top zipper closure with convenient wristlet strap. Faux Leather & Rhinestone. Premium quality faux leather. Rhinestone embellished bow charm. Color: BLACK.